Fredric: Right on the money! 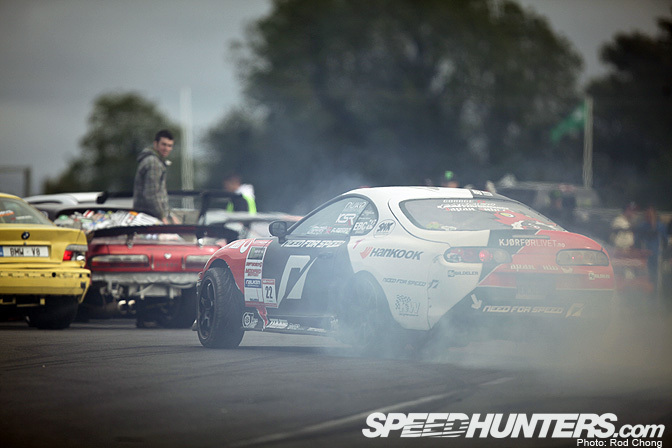 The Prodrift Mondello finals were definitely one for the books. Fredric: I’ll start where we left off in part 1 – at the very moment we lined up for the Top 16 driver introductions. Fredric: The crowd was crazy loud! The Irish certainly knows how to put on a warm welcome! I stood right next to my top 16 battle opponent Mike Deane, and just like the rest of the Deanes (there’s a lot of them!) he brings a great vibe. With all the anticipation in the air and Mike looking like a young Robert Redford it kind of felt like we were at the grid for a 60’s Le Mans race! Darren: Commentator extraordinaire Dave Egan was bigging me up on the driver introduction. It was so cool to be back home and see the level of cars and drivers lined up for the Top16. I knew every battle was going to be epic!! Fredric: I remember getting proper goosebumps when Dave called off the driver introductions by shouting “Gentlemen! Start your engines!”… You could tell right there and then that we were all in for an amazing show!! Darren: Amazingly in my first battle i got drawn against life long friend and next door neighbour Damien Mulvey. 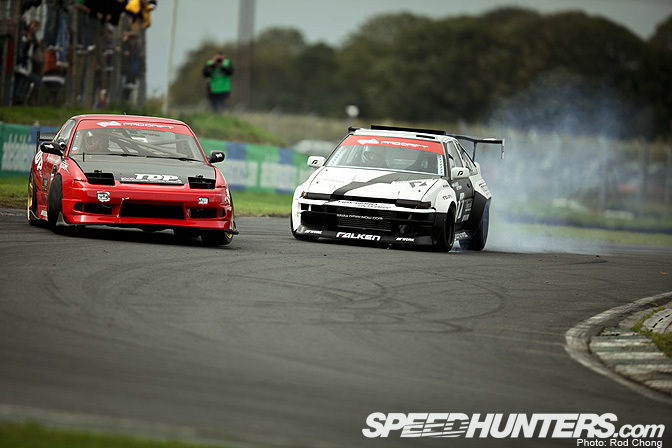 I don’t think Damien and I have gone head to head since Prodrift Mondello 2006 when we met in the final to decide the 2006 Irish Championship. 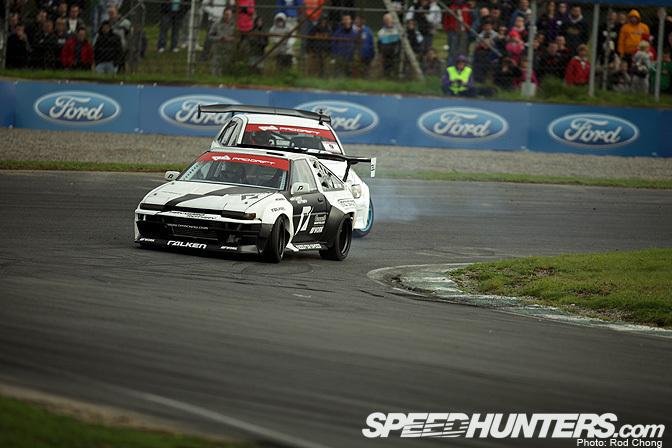 Fredric: Watching you two go at it was epic and made me remember why I love drifting. 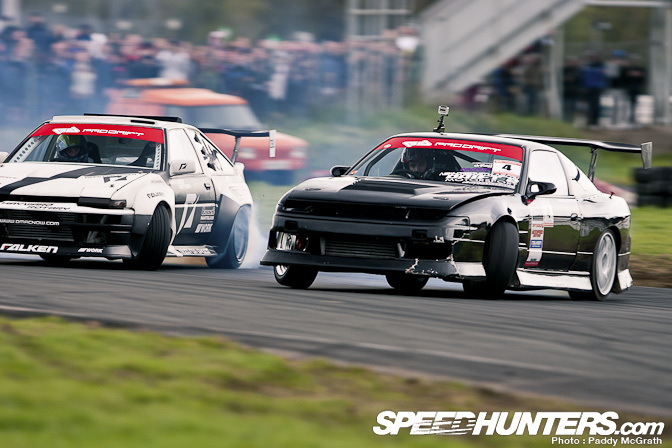 That’s two VERY determined racers right there! Darren: Damien is a great driver and knows how to set up a car. 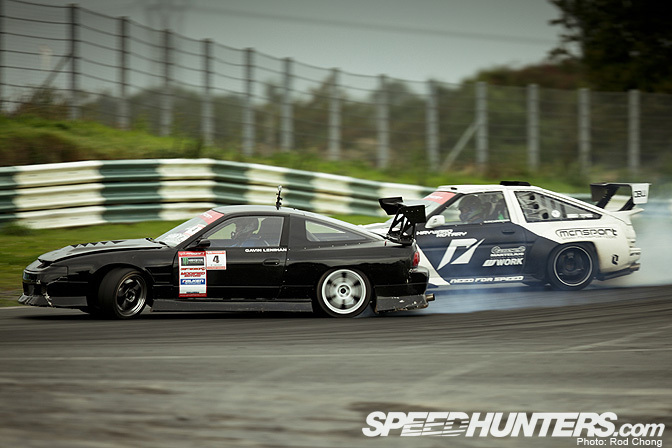 There would be no such thing as an easy battle today in Mondello. Darren: I followed as close as i could but i just couldn’t be as aggressive as i wanted with the suspension compromises we had to make and the steering still not perfected. Darren: When i was out in front and didn’t have to adjust to another car i was at my strongest. 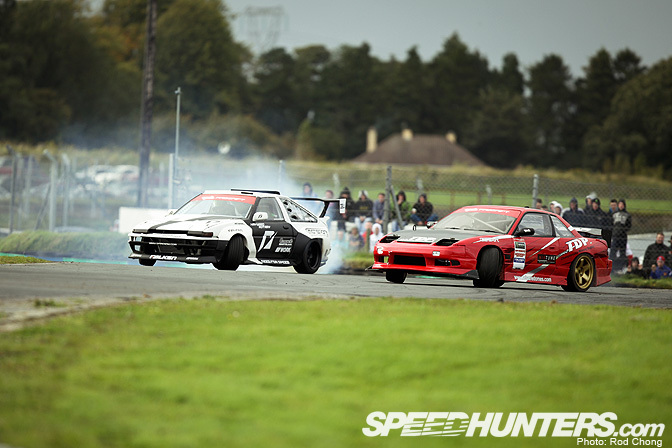 Myself and Damien were 2 of the fastest cars in qualifying so i knew i had to go all out on entry. 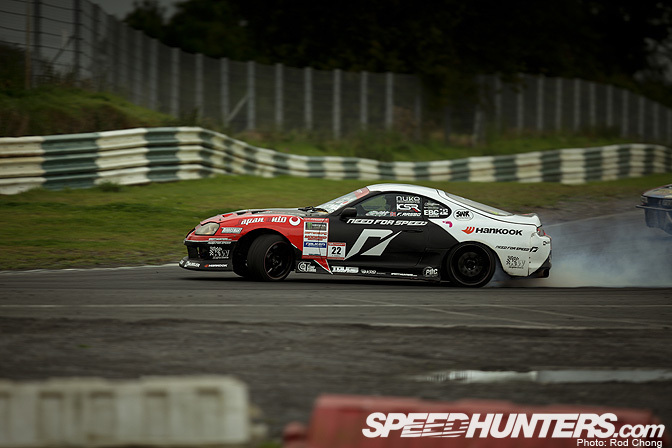 Fredric: One thing I think is worth mentioning is how yours and Damien’s cars really push the envelope of Irish drift car builds with the front and rear sections cut off and tubed up, etc. 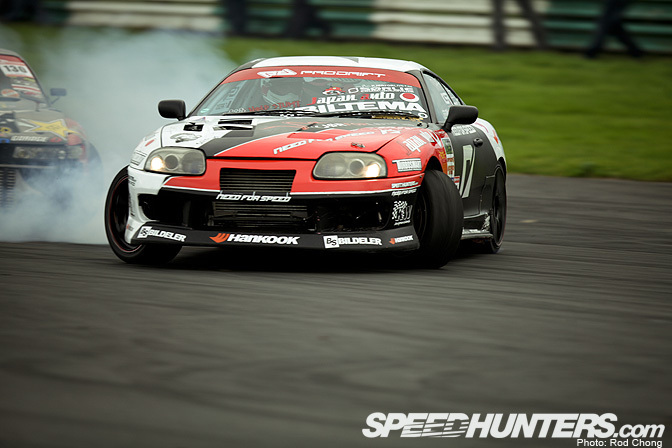 Rather than crazy power it seems the “Prodrift recipe” is light and nimble and maybe more so than anywhere else. I think this is partly down to the restricted tire regulation that practically outlaws R-compound tires, which I am all positive for as it greatly reduces the cost and makes it much more viable for any tire company to get involved. Only problem with that is it might take away a little of the diversity by making it harder to get the grip and speed from a heavier car/motor, effectively banning and/or cost prohibiting bigger cars if you want to try to hang with the light builds. Darren: To be honest i think there is a ratio the of power:weight:grip which in theory could make any car work. 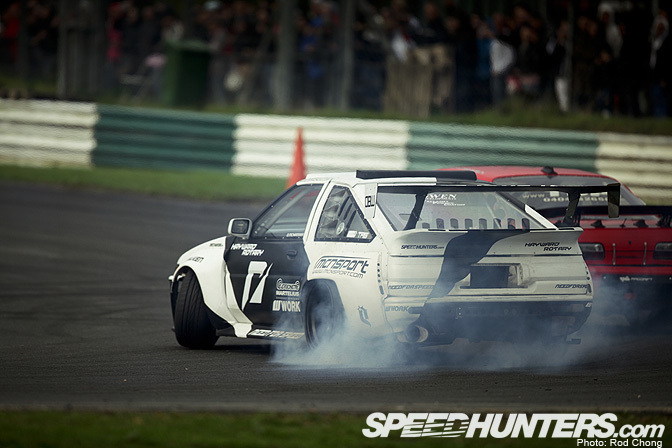 Both me and Damien have been around a lot of race cars so we know a good idea when we see one. 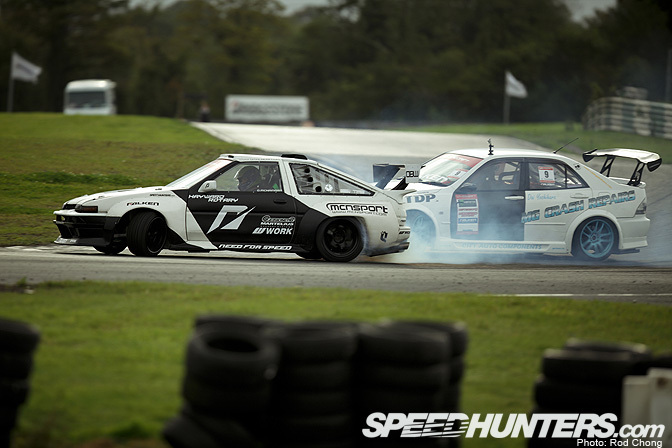 We also have crashed a lot of cars and the front and rear tubing makes the cars just so much easier to repair. A car with front and rear tubing should be salvageable where a car with original chassis rails would be twisted to the point where it would have to be replaced. the availability of the “S” body here in right hand drive has really given it a grip on the scene and the bigger cars just don’t have the parts available and therefore don’t seem such a good platform. Also the availability of the “S” body has made them cheap which is king in a small country. 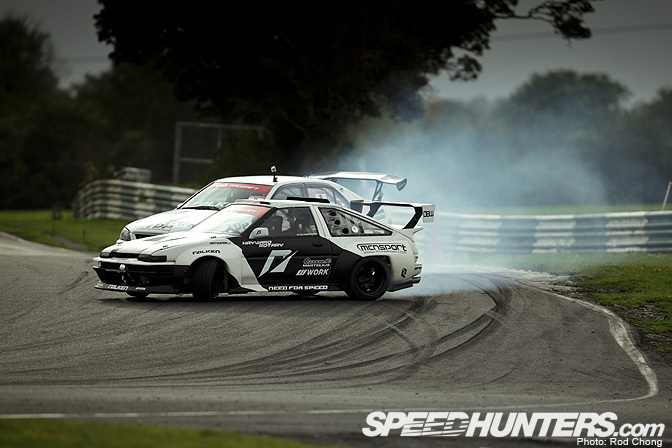 Fredric: I agree with your power/weight/grip formula, but you have to be able to get the grip, though… I think the Prodrift way is the absolutely best compromise though and it will be interesting to see if a tire to weight rule or a minimum weight rule or something along those lines will be brought in eventually. Fredric: And blew the ear drums of everybody in the grandstands! 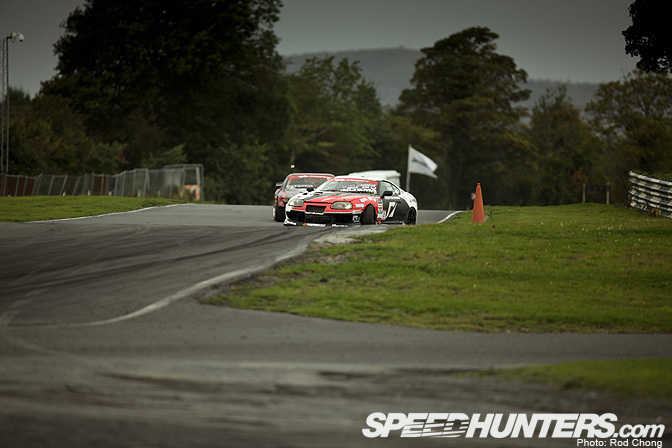 I think the sound is best described as a thousand RC car nitro engines blasting past you… Which is a good thing! 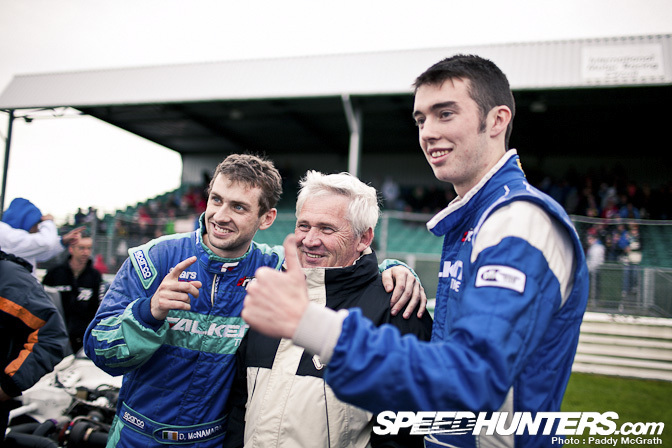 Darren: Falken Tire smoke fills Mondello as we power our way into the Top8. 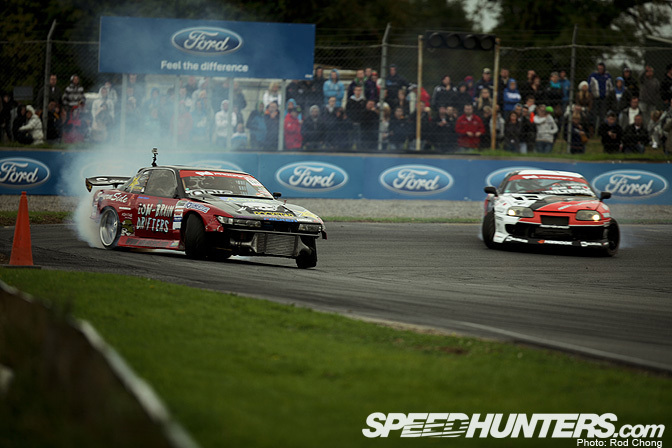 Competition is so stiff in the Prodrift series its miles ahead of anything else in Europe. What do you think of the competition Freddy? Fredric: What totally blew me away is how even the entire field is. It feels like any driver in the top 16 could win! I think this is partly the result of such a broad field of drivers – close to a hundred entries were counted for the three different classes! Fredric: I absolutely love this shot on sooo many levels. That’s all I have to say. My Top 16 battle was ON! Fredric: Mike Deane chased me down like a blood hound, and you can clearly see what sort of competition we were up against. 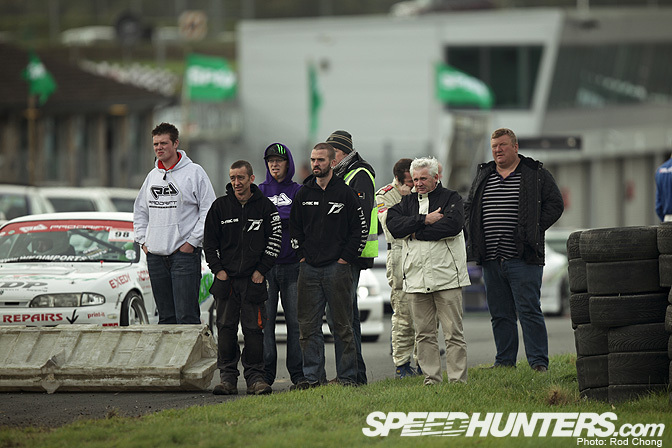 Having qualified second meant very little in this field of amazing drivers! Fredric: Mike had a 10 km/h speed advantage on me in qualifying, which is a lot, and I knew he would be right there on my rear quarter. My goal was to go through the course with good style and angle and hope we could come out even or with a slight advantage. Fredric: But somehow Mike lost proximity through the last turn. Fredric: I have no idea where he is! After chasing so close for the first portion he fell away for the last three clips. When turning around to head back to the start line I did an extra donut to spot Steffen among the crowd by the finish line. He gave me a thumbs up, which meant advantage to us. We had no radios for this event but good old hand signals worked fine here. Fredric: I kept a slightly narrower line than Mike to catch up slightly without ignoring the outer clips. I had a big need for speed!! 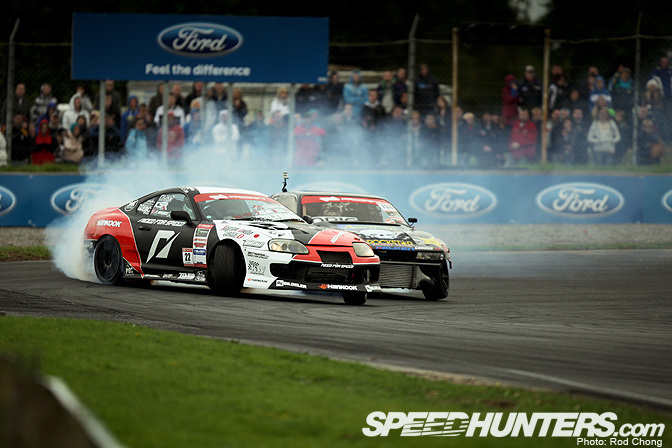 Fredric: Mike was at the verge of getting away, but I managed to stay composed and not lose too much on him. And as we parked and anxiously awaited the scores, the judges decision came through. We got the win! WE WERE THROUGH TO THE TOP 8!! This was a huge accomplishment for us in this super competitive field of drivers! Mike – thanks for a good battle! Darren: Things didn’t get much easier in the Great 8 when i had to face friend and Falken Tire USA team mate Dai Yoshihara. Dai was Driving a loaner Altezza but had gotten to grips with the car very well. If I could concentrate on making no mistakes then hopefully he would make one first..
Darren: I entered very close and wanted to keep pressure on Dai for the entire run. Darren: But i made a correction on the transition again while following. We needed to make a couple of changes to the rear setup but just didn’t have the parts with us to do it. It was very frustrating. Darren: I knew i had to get the advantage back while leading. From our qualifying speeds i knew i was faster than Dai and i was going to have to go all out and try to pull away to go one more time. Darren: The Altezza was not so lucky. There is a lot of controversy over whether Dai dropped 1 or 2 wheels at this point but luckily for me the judges deemed it to be 2 (queue the Dai only dropped one wheel comments below). Of course I had no idea all this was going on behind me and i was concentrating on wrestling my beast 86 through the transition and turn 2. Darren: As we pulled to the finish i just wanted to get out and get the formalities over with. Darren: Im pretty sure my crew and friends thought that was it for us as well. They had seen the dirt drop from Dai but thought I had blown the gearbox too. Darren: I got out and Milo the PD Marshall said ”I’d say you got this one”. I asked him what battle was he watching and even as the judges gave the decision i couldn’t hear them properly with the 2 cars running. All i got was the ”ara” bit which i presumed to be Dai Yoshihara. I pulled off track and my crew were ecstatic. I couldn’t believe it and thought to myself we have just used up all our luck for the next 10 years. Fredric: I was at the grid as we were changing tires and just remember you coming in with your hands in the air looking all confused. 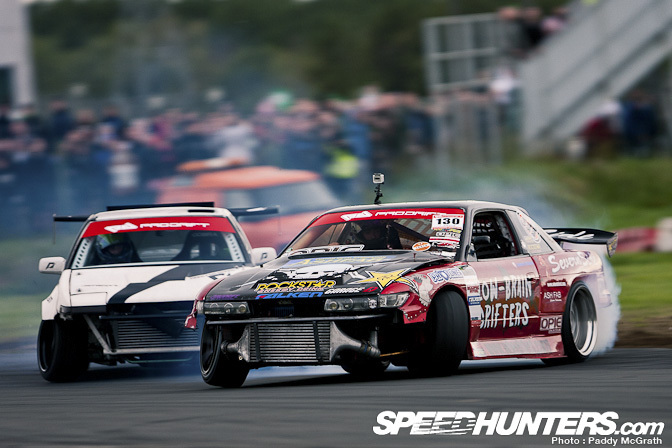 Anything can and will happen in drifting, right? That’s what’s so cool about it – nothing’s a given! Darren: Meanwhile other people were having problems. 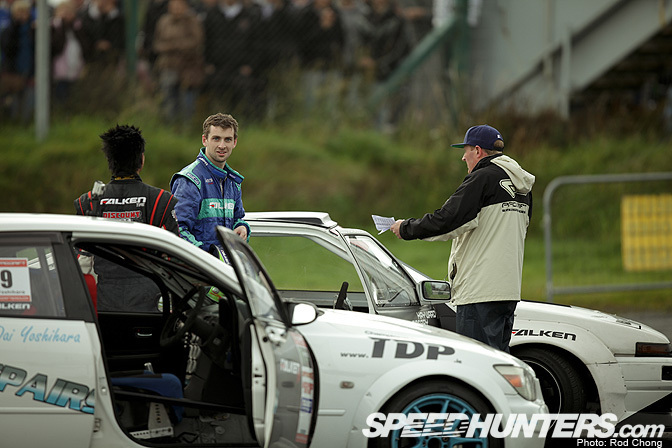 James had a fuel problem on the way to the start line and had to call 5 mins. He was very lucky this happened before he got to the line. God there was so much drama!! Fredric: This was in James’ battle with me… We both left the grid together to head for the start line, but as I got there James wasn’t to be seen The starter told me he had called for five minutes due to a fuel leak. As I was sitting there at the start line manning up for what I knew would be a very tough one, I came to think of the last time I battled James back in 2008. I was lucky enough to get away with that one, but was it to be this time? 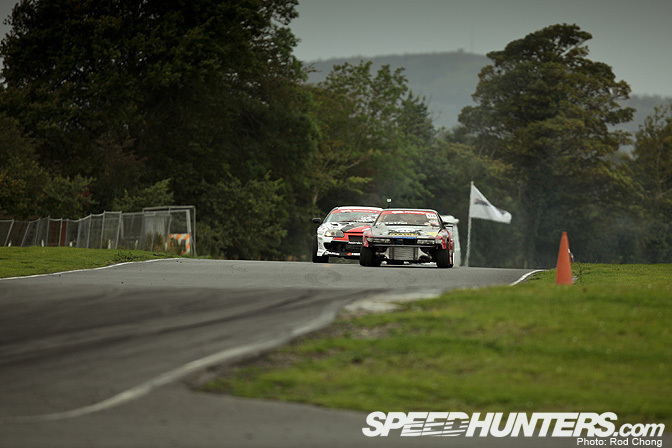 Fredric: James eventually got to the start line and before we went at it he told me he had lost second gear on the way up… He asked me if I could pace him as he would be changing directly from 1st to 3rd.. I said of course. As we launched I had to wait for him for a looong time. Fredric: As James struggled with building boost in third we were going a lot slower than usual, which meant we would both have to attack the corner differently than we were used to. 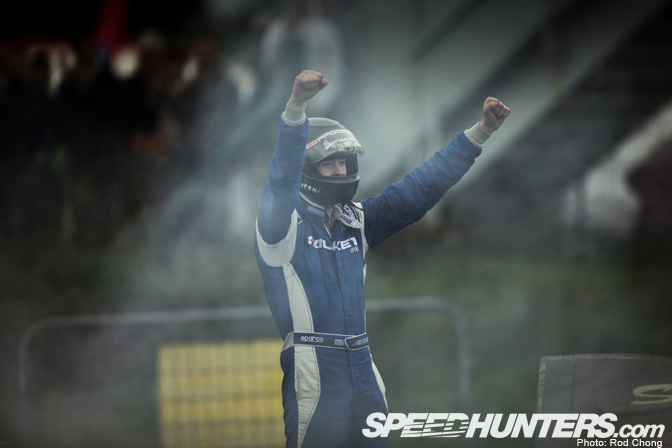 Fredric: I got on throttle as soon as I could to get through there as fast and committed as I possibly could. Fredric: And right behind me was a very fast James Deane. I had watched James in practice and his lead runs were good. His chase runs, however, were amazing and definitely the best out there!! Did I mention we had some steep competition? Fredric: Exiting turn two he was right there. 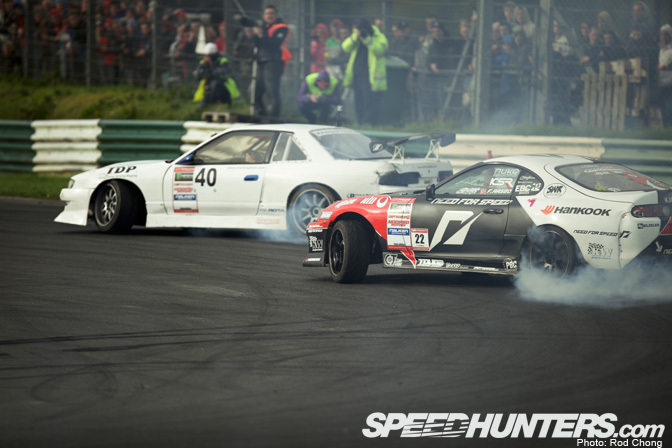 Fredric: Turbozilla was trying to eat the Supra alive! Fredric: Steffen gave me a wobble hand sign indicating he thought it was a fairly even match . I turned around and chased James back up to the start line so we could swap positions! Fredric: I knew this was what it all came down to. 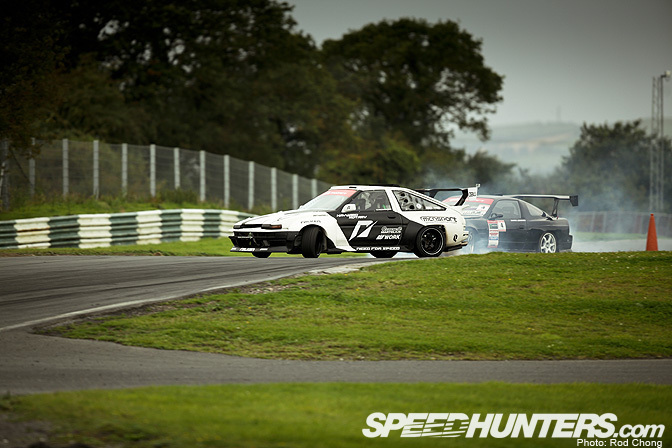 As James launched, and changed from first directly to third yet again, his car lagged, lagged, and lagged some more as pretty much any high strung turbo motor would do in such a situation. I was unsure of when he would come on boost, and was on his side for some while, but had to tuck in behind him to set up for the entry as I knew the judges wanted the two cars to be on line. Then, his boost kicked in and James reached warp speed in a second. Instant VTEC!! Fredric: … and then I got on the throttle too early in an effort to keep up with the sticker bombed low-brain pirate ship in front of me! Fredric: Dirt everywhere and photographers hiding from the spray. Sorry guys!! It’s just a loose cannon, nothing to worry about! Fredric: I knew my odds were fairly low at this point, but there was no way I was giving up. 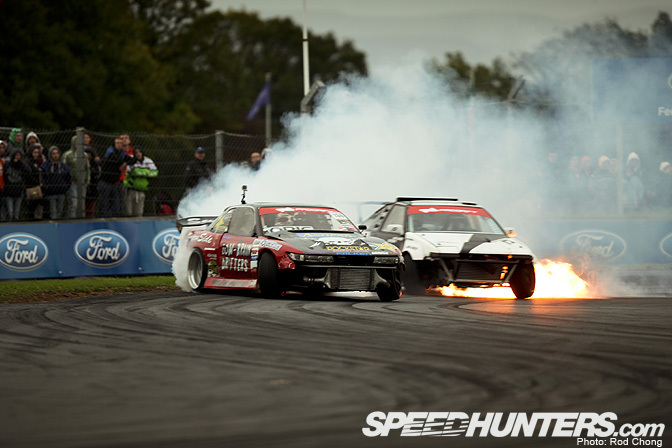 Fredric: Apparently no one could predict when James’ car would go out in a fireball following his two faults before we even started to battle (no pun intended, Mr. Barnes! ), but he was lightning fast, did zero mistakes and reached the finish line roughly half an hour before me. Fredric: A much, much deserved win to the the brave James Deane!! Fredric: James later came over to me calling me a gentleman and sincerely thanking me for pacing him so much in his first run. He has a very humble wrapping, this one devil kid, haha! 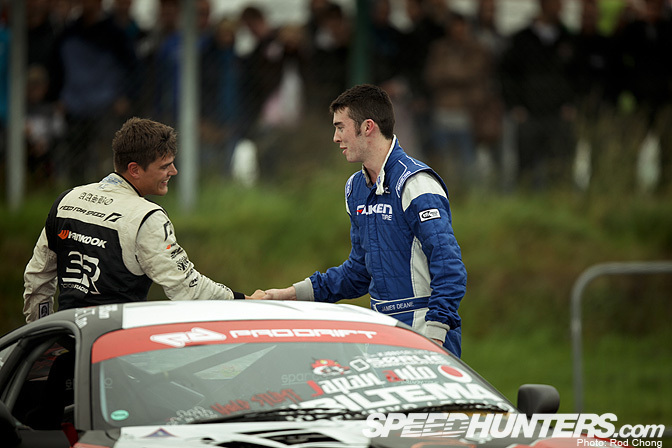 Darren: With Freddy gone i had to uphold Team NFS honours like he did in Silverstone. I was paired against hard charging Gavin Linehan in the Final 4. 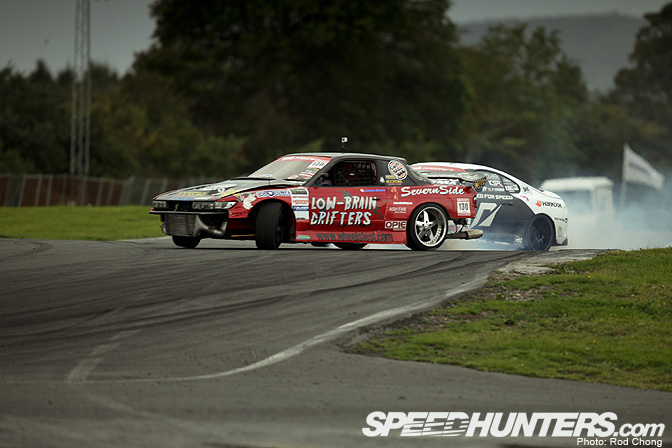 Gavin was on it and is a really aggressive twin drifter. Darren: I couldn’t shake him for the whole run and he probably got an advantage for being so close. These guys are so hard to beat!! 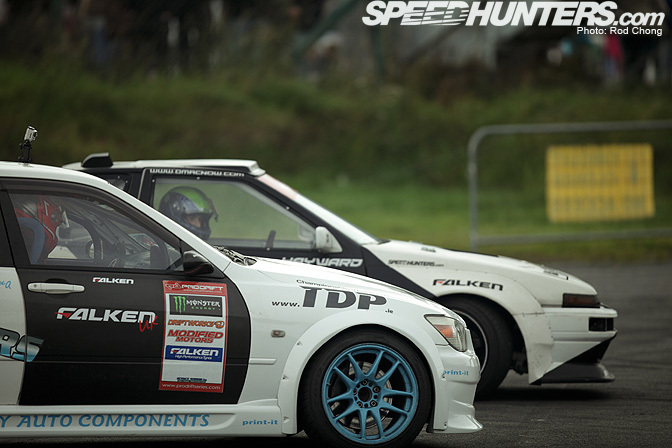 Darren: I checked my mirrors after the run and it was full of black Linehan Silvia. I knew this could be the hardest battle of all to get through and i couldn’t afford to give him an inch while chasing. 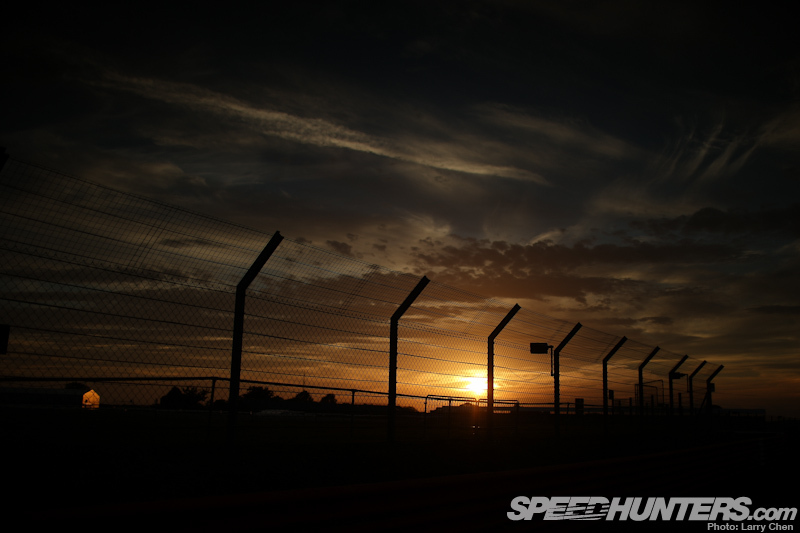 Darren: So to run 2 and a combined 900 horsepower blasts into turn 1…. Darren: I was right on his back bumper in turn 2 and looking to creep up to his door when…..
Darren: He straightened out in front of me. 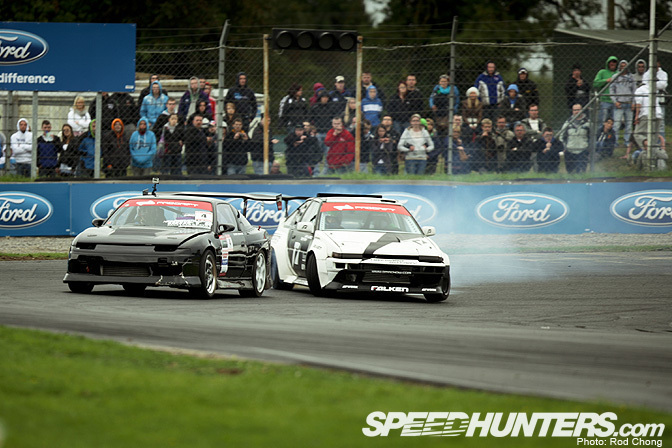 I couldn’t believe it, we had rode our luck from the previous battle and now we were heading to the final of Prodrift Round 5. Gavin told me later that he had just asked too much from his clutch at this point and it slipped. Darren: DOOR WARPING SPEED!!!! Team Need for Speed second Final in 2 events. Amazing work guys!! Fredric: YES!!! 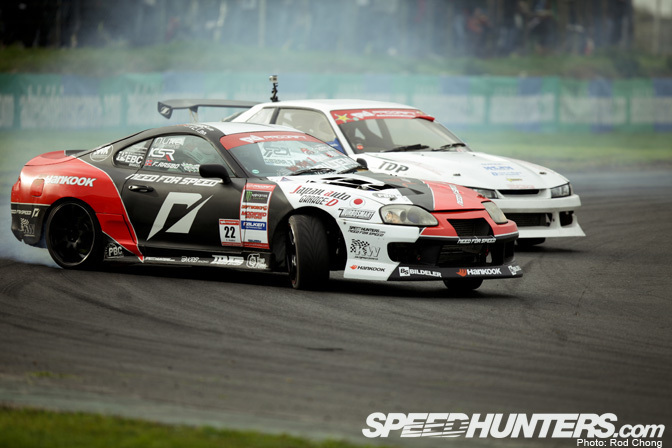 The red Prodrift banner is your lucky charm! Darren: And then it was final time. I was really enjoying myself at this point. 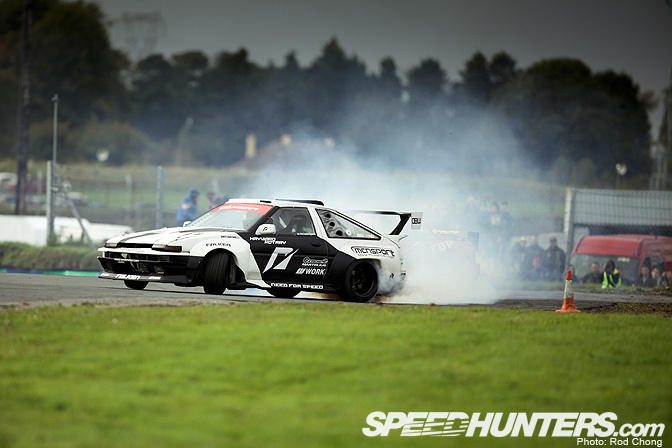 This was one of the best drift events I’ve ever been to and to get all the way to the final with the new car was an amazing result. 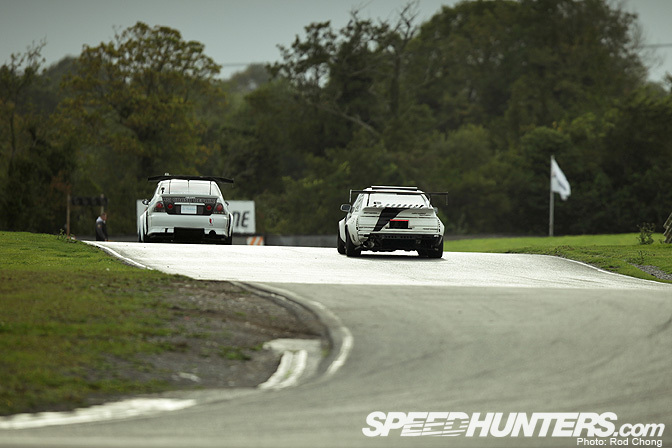 I would be up against James Deane who has become incredibly consistent since he switched to the S13 but he had blown 2nd and 4th gear so I was confident that i could win this one. Darren: But……. I had used up all my luck on this day. We entered turn 1 incredibly slowly. I was expecting James to be slow but it still took me by surprise. His car took so long to come on boost between 1st and 3rd gear. 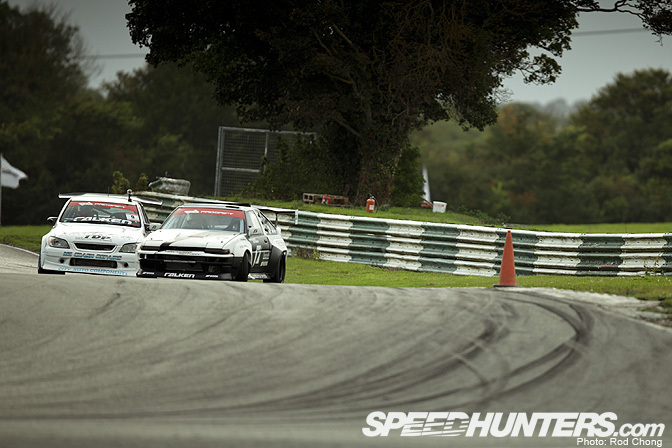 I remember coming down the straight about 50feet from the entry point and i still had 2 gears to go. When i entered behind James my car gripped and drove forward because we didn’t have the speed momentum to float the car on the proper line. My inside wheel went over the kerb and there was a big bang!!! 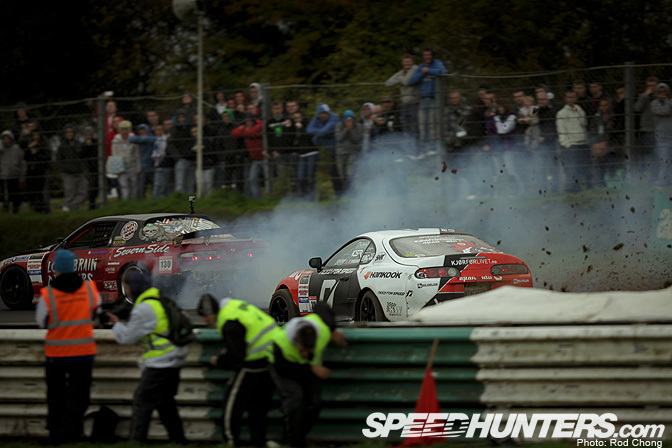 Darren: I had lost and destroyed my front bumper. The bank off the kerb had caused me to correct slightly and throw me off line and i ended up putting another wheel off but the car still seemed to be driving fine. 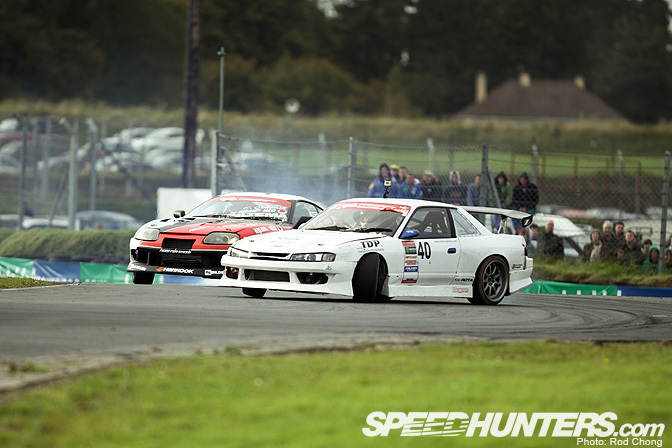 Fredric: It was crazy to see you guys battle and I swear the entire Mondello Park was shaking from excitement!! Also, it was interesting to see how a lot of the battles that were lost were down to one or two tires dropped off course at the exit of turn one. A very tricky section! Darren: It was my sump bung that had caught the kerb and because we drift this track the opposite way to how it was designed the kerb ripped the weld open and was spewing oil. 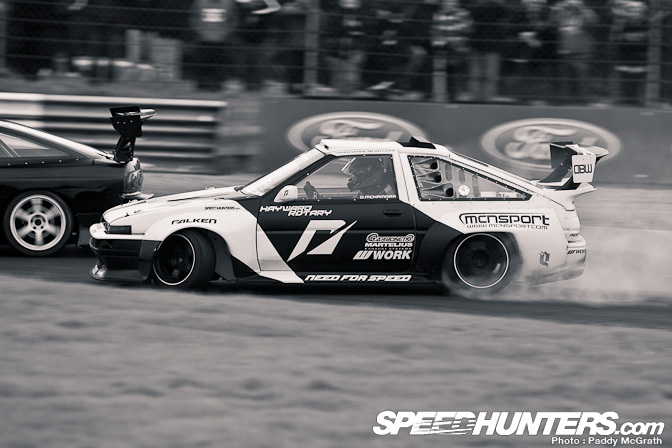 I got back on the power to chase James and the Rotary spooled the turbo to full boost and opened the 60mm waste-gate which led to the moment that captures the awesomeness of this whole event. Darren: The flames from the waste-gate ignited the escaping oil in a pretty large fireball. 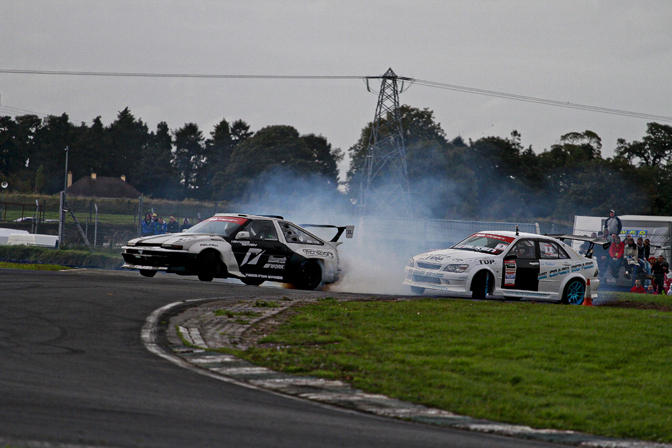 We had tire smoke and fire smoke in the final, we had everything in Mondello this weekend. Darren: I was very happy with how i could stay close to James in this run and was already thinking that i was well down on points so i would have to blow him away on the second run which would have been very possible because he had no second gear. Darren: But it was not to be…. Once i got to the finish line everyone rushed to the car and i knew something was very wrong. I had seen the flames while driving but my brain was still in win mode and i wanted to finish the battle so bad. The car proceeded to leak all its oil in a huge pool on the ground which was met by a big ”ooooooohhhhhhh” from the crowd and that was that…. Darren: In the grand scheme of this it was another great result and a very successful Need for Speed Tour both me and Freddy embarked on. My dad here in the middle was a little happier than i was but i was really excited to get back to the workshop and make the changes to the car. There is so much potential left i cant wait to get back on track!! 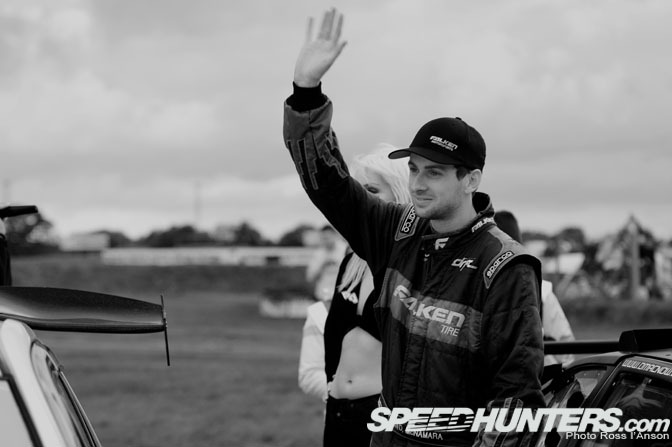 Fredric: I want to direct a special thanks to the entire NFS crew and the McNamara’s, including Dmac’s mechanic Happy-Darren and Damien Mulvey for all the help and all the fun we have had throughout these two weeks. I wish we could do it again! 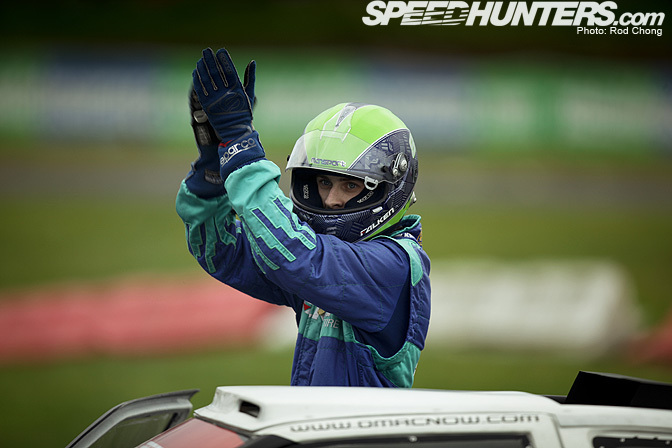 Also, a big congrats go out to James Deane for his fantastic result – incredible and well done!! The force is strong in this one. 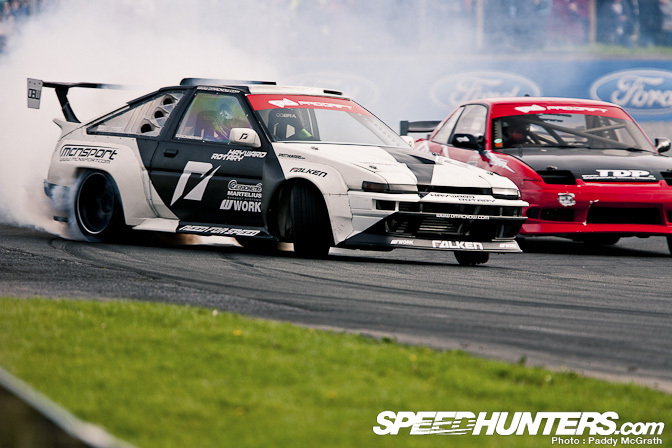 Thanks for your time – up next for us: The Formula Drift finals at Irwindale… Oh boy! 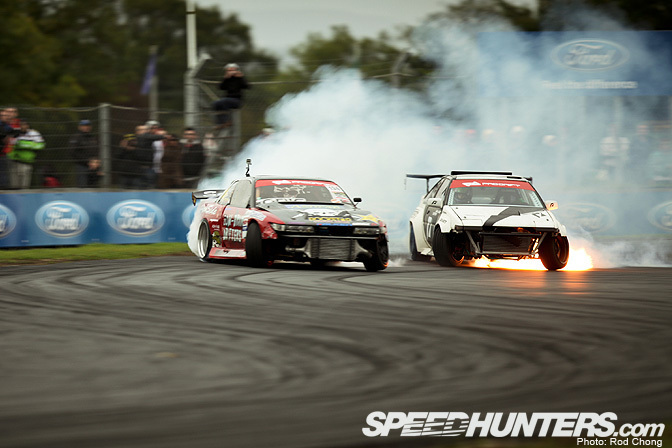 Funny Fredric hit the nail on the head when he said the 13b sounded like a thousand rc nitro gas cars. my wife and i said the exact same thing about my 91 fc. that event looked a like it was stupid fun. i wish i was there. Lets see...Dai dropped a wheel, maybe 2, but keeps drifting close. Darren STOPS drifting the last 2 corners. Darren gets the win. The little elevation changes in this track look so fun. Rad post dudes. Well two wheels equal a 0, and streighting is just as good as a 0. In america we would say....OMT!!!!! Go and read ye'r facts before posting moronic ill informed comments on here please and thank you! Twas an absolute pleasure to be apart of these few weeks with the team and hope to do it again! 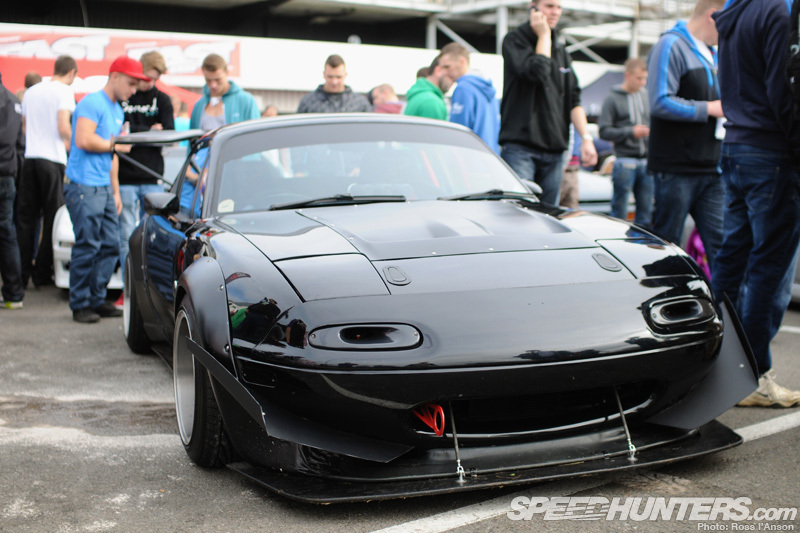 The supra has a great looking " " face. That is all. That was long... but a good read! I love reading the blogs from both of you, do more.